What’s in the mind of a Goldendawner? It’s with these questions that I began filming, at about end of 2009 to early 2010. But, the more I was getting on with the research, the more I realized that my motive was fear. With a father-in-law and a grandmother in the Resistance, a mother-in-law that had to take off the yellow star in order to pass through enemy lines and bring back food to her family, with an uncle and an aunt that returned from Auschwitz, I was brought up with stories of the War. A world that, I was told, would never exist again. As I gathered more and more images, I was getting the feeling that no, it isn’t like that. I was obsessed with the men in black: “How could someone be a Goldendawner today?” I had this question every single day. To this day still, after five years of research, this question remains. I don’t have an answer. The crisis is not the only explanation. 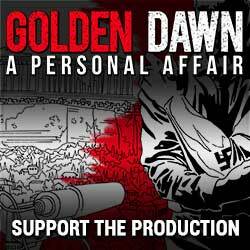 Those who choose and vote for the Golden Dawn have various, different motives. What I know, though, is that they are extremely dangerous. Especially because few people take them seriously. This film is not answering the questions I had and I still have. I do hope though that it is bringing into the light enough evidence for all to understand how dangerous Golden Dawn is. 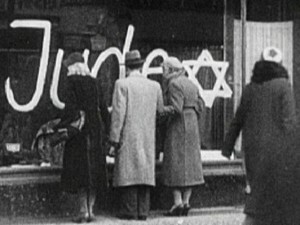 Because, in the end, there’s no difference at all between Golden Dawn’s “Greece to the Greeks” and the Nazi inscription “Jude” on Jews’ shops. In both cases, society did not react.